Since 1995 V.T.A.C. 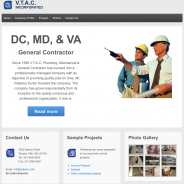 Plumbing, Mechanical & General Contractor has evolved into a professionally managed company with an objective of providing quality jobs on time. Mr. Vitaliano Duran founded the company. The company has grown exponentially from its inception to the quality conscious and professional organization, it now is. V.T.A.C. is committed to its mission statement, which is: “Maintaining confidence and trust with others, subcontractors and suppliers”. The company is socially and environmentally conscious,V.T.A.C. currently has skilled professionals from 75% to 100% of a job with our own work force.